Event Description: I was in the far right lane driving down Independence Road, just starting to pass Hidden Cove Road when this fuktard makes an ILLEGAL u-turn right in front of me while I was passing Hidden Cove Road, cuts me off and then drives SLOW!! IN A PORSCHE!!!! (there is a sign there in the median in front of Hidden Cove that states NO U-TURNS) On top of that, this douchebag was driving IN THE DARK/BAD WEATHER with NO headlights on!!! 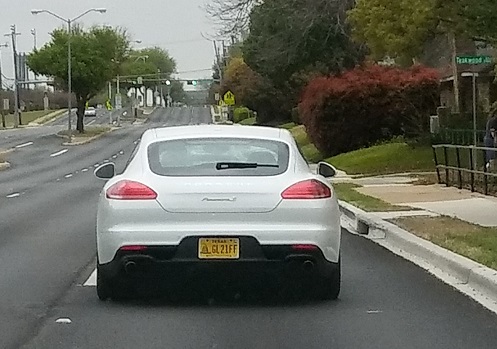 I had to hit my brakes and jerk over into the center lane to avoid this fuktard moron. I was lucky there wasn’t any other traffic at that time. Then this brainless turd starts driving SLOW! Obviously the DMV needs to be checked for the morons they hire, because obviously they give licenses to kill to every brain dead piece of crap that walks through the DMV doors!!! !